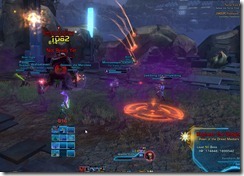 This is the boss strat for Kephess the Undying, the fourth boss in SWTOR Terror from Beyond TFB Operation in Patch 1.4. Included are strats for storymode with hardmode coming shortly. Phase 1: Tank swap The tank tanking Kephess will get two debuffs on him/her and glow. 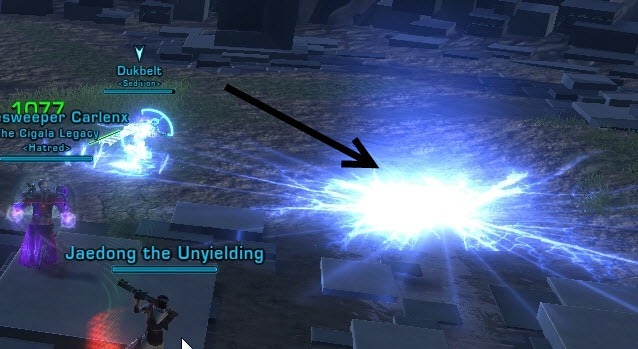 When this happens, the other tank will need to taunt Kephess so that the glowy tank can run to the big glowy circle on the ground to remove the two debuffs. Phase 1: Focused Laser Blast Move Kephess to the pillar his laser beams are attached to. 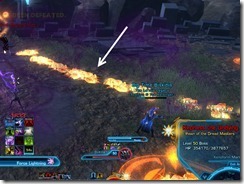 The person being blasted can either run behind the pillar or in front of it (but face Kephess). This will cause Kephess to get knocked down temporarily and take increased damage. Phase 2: Red & blue circles Kephess will leap from ground, creating a pulsating and expanding blue circle to jump down on a random player marked by a red circle. Avoid both circles. Phase 2: Corrupted Nanites Run to one of the pilars and start the channel to get it removed. Destroying the pillar (finishing the channel) when Kephess is near will cause him to get knocked down for increased damage. Phase 1 has very simple mechanics and is designed to ease you into the fight. One of the tanks tanking Kephess will receive two debuffs and start to glow. 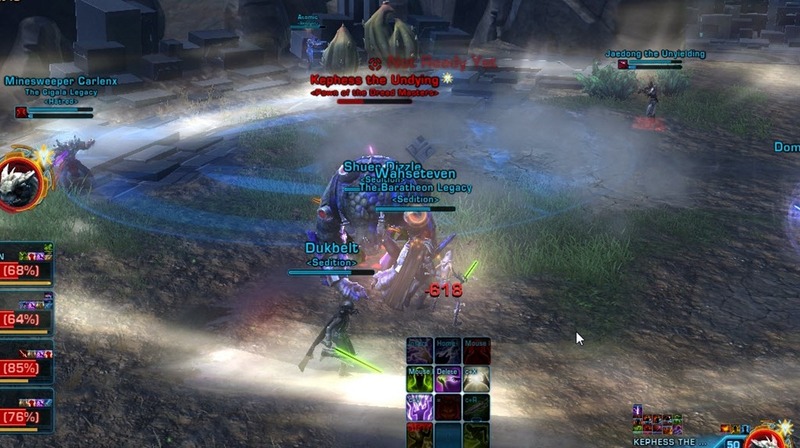 When this happens, the other tank need to taunt Kephess so that the tank with the debuff can run to the glowing pool in the center of the room to cleanse himself (other players should avoid the pool). Kephess will have a laser beam attached to him periodically throughout the fight. The tanks need to locate the pillar it is attached to and move Kephess to that pillar. Soon after, you will get a red text message on the screen: Kephess Charges a Focused Laser Blast at Player X! This is the cue for that player to either run behind the pillar or in front of it to squeeze out some additional DPS (but they must be facing Kephess). 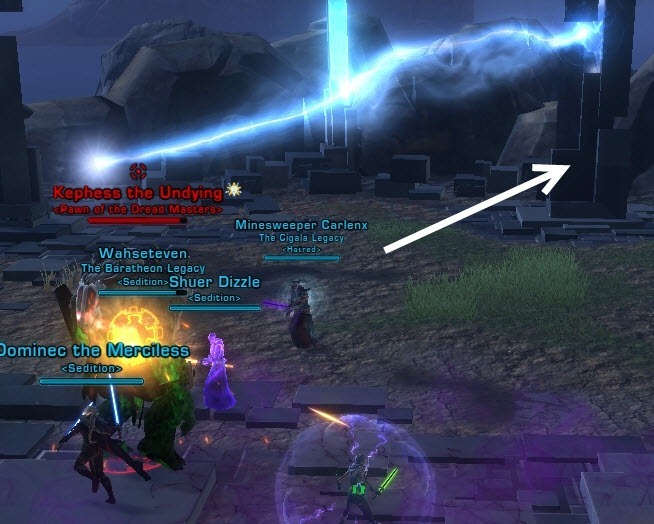 Kephes will channel a 9 second Laser Blast, and the player will take damage (need heals) even if they are behind the pillar. At the end of the 9 second cast, Kephess will be knocked to the ground for a few second and you can do increased damage to him while he is in that state. You pretty much repeat this until Kephess is ~ 50%, which triggers phase 2. There will be a big red circle in the middle of the room to which Kephess make will a landing from the air. The landing will cause walls to radiate out from him but the walls move so slow that they are easy to avoid. Phase 2 gets a bit more chaotic. Kephess will put down a red circle on a random player that will follow the player for a second or two. The red circle will then disappear and then Kephess will jump down on the area the red circle was in previously while leaving an expanding blue circle. 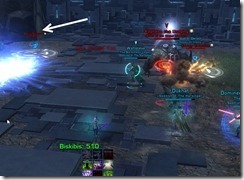 Players will need to run out from the red circle (it is fairly easy to avoid) and stay away from the blue circle to prevent damage to themselves. 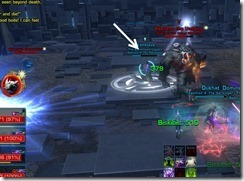 The blue circle is called Pulse Tremors in the combat logs and deals 1530 damage per second that the player stands in it. When Kephess jumps to a player with the red circle, he may perform an AoE attack called Earthquake while being taunted back to the tank. This attack deals low raidwide damage (~ 600 damage). Corrupted Nanites is a 30 second DoT casted on a random player that deals 1143 damage every 3 seconds (11k damage over 30 seconds). You will see a red text on screen: Corrupted Nanites on YOU! as well as a circle icon above your head. You can run to one of the clickable pillars and click it to channel a skill called Hypergate Tower to remove the Corrupted Nanites. Corrupted Nanites is removed as soon you start the channel (you can cancel the channel right away). The channel itself is a 13.5/14 seconds channel and the pillar will be destroyed if everyone on it either finish or cancel the channel. 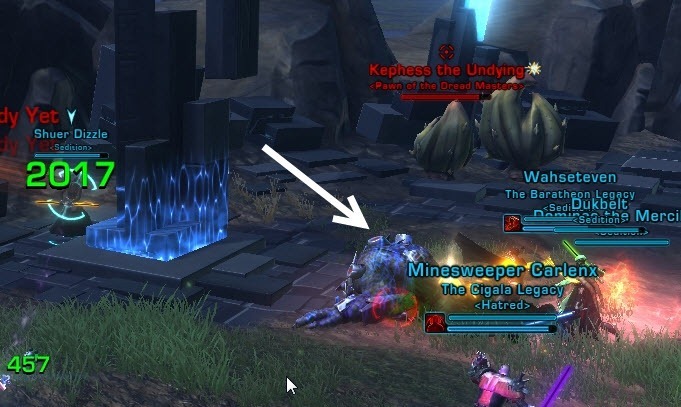 If Kephess near the pillar when it is destroyed, Kephess will be knocked down temporarily again, allowing you to do increased damage to him for a couple seconds. 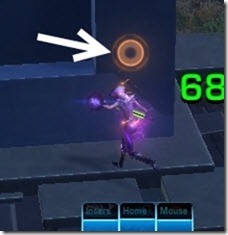 Since Corrupted Nanites is removed as soon as you start the channel, a number of people can use the same pillar to remove the debuff if they keep the pillar alive (start channeling, wait for the next person to channel and then cancel your channel). Phase 3 is triggered when Kephess reaches 10% HP. He will basically shoot mortars at the entire raid using a skill called Volatile Emission.. 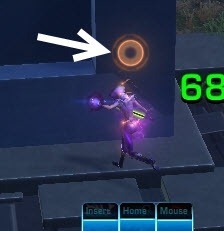 This skill is easily avoidable (orange circles on ground). In addition, Kephess will also does an raidwide AoE called Fury of the Masters that deals ~800 damage per second and serves as a soft enrage mechanic. 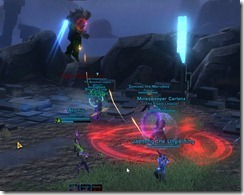 P1: Energy Distortions They will spawn in the middle of the room and tag on the nearest player. 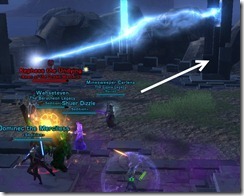 Once tagged, only that player can damage the energy distortion. It is essential that DPS run into the white circles and grab it ASAP. P2: Dread Bomb The red circles on a random raid member that indicates where Kephess will jump down is unavoidable and deals aton of damage. Bubble shield + top that player off. P2: Radioactive Barrage Person being targeted by this barrage should move away from the raid and leave the barrage trail in an empty area. The farthest person in the raid seems to be most likely targeted by this barrage. P3: Fury of the Masters &Volatile Emission Kephess is a lot more unforgiving on P3, it is recommended that you do the last pillar at 11% so you can knock Kephess down and shave a couple % off Kephess to help survive this phase. 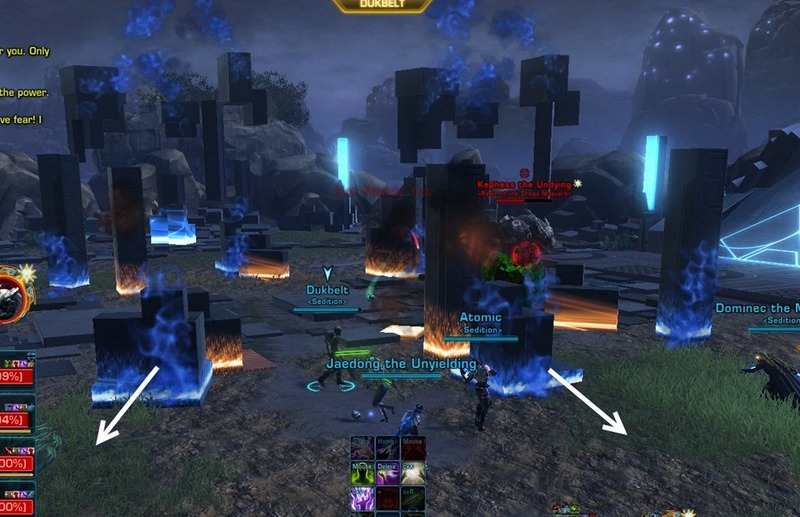 Due to the strict enrage timer on Kephess, it is recommended that you do not miss a single pillar in phase 1. You do not have to stand next to the pillar, as long you are under the electric line/beam connecting Kephess to that pillar it will work. 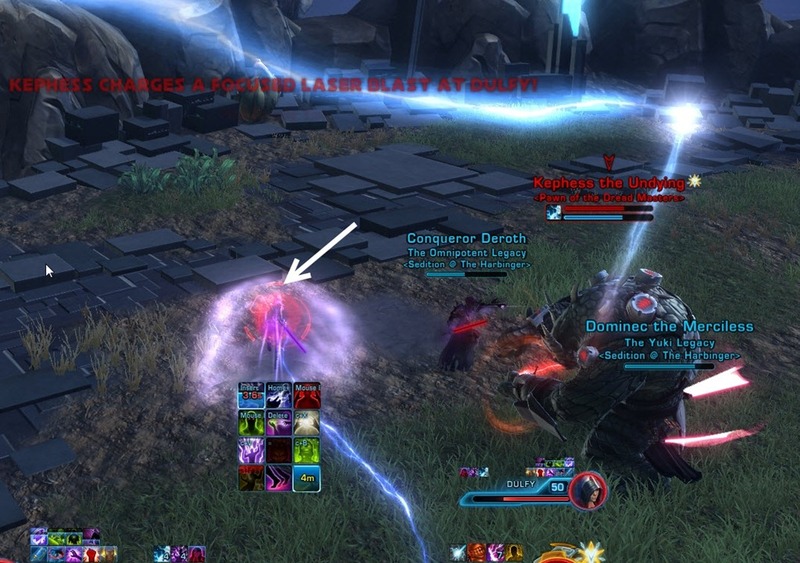 Also, make sure that the person being targeted by Laser Blast runs to their position ASAP so that Kephess gets 4 stacks of the damage increase debuff for maximize DPS. Kephess’s Laser Blast deals quite a lot of damage in hardmode so it is essential that the targeted person gets topped off and receive dedicated healing from a healer. Sorcs/sages can also bubble shield them to lower the incoming damage. Energy Distortions are two orbs that spawn in the middle of the room. They each have 10k HP and will attach onto the nearest person. After they spawn, they have a white circle underneath them for a couple of seconds. Those who run into the white circle will get the energy distortions attached onto them. If no one runs into the white circle, they will pick the person closest to them and place the white circle underneath them. Each energy distortion have about 10k HP but they cannot be damaged by other players once they are attached onto someone. For that reason, it is recommended that DPS pick them up ASAP and kill them. Having them attached to tanks isn’t too bad as Kephess’s ability that cause tanks to glow will kill these energy distortions. Having these attached onto healers is generally bad as they will need to stop healing in order to kill them. 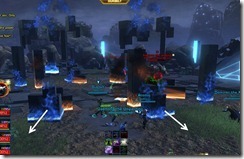 These energy distortions will do a pulsating AoE damage that increases in damage overtime. Failure to kill them in a timely manner will cause the raid to take large amount of damage. Unlike storymode, the pulsating blue circle that marks where Kephess took off no longer exists. Instead, the red circle that Kephess places on a random raid member to indicate the position he will land is no longer avoidable. It deals ~19k damage to the targeted player. If the person is not topped off, they will most likely get one shot. 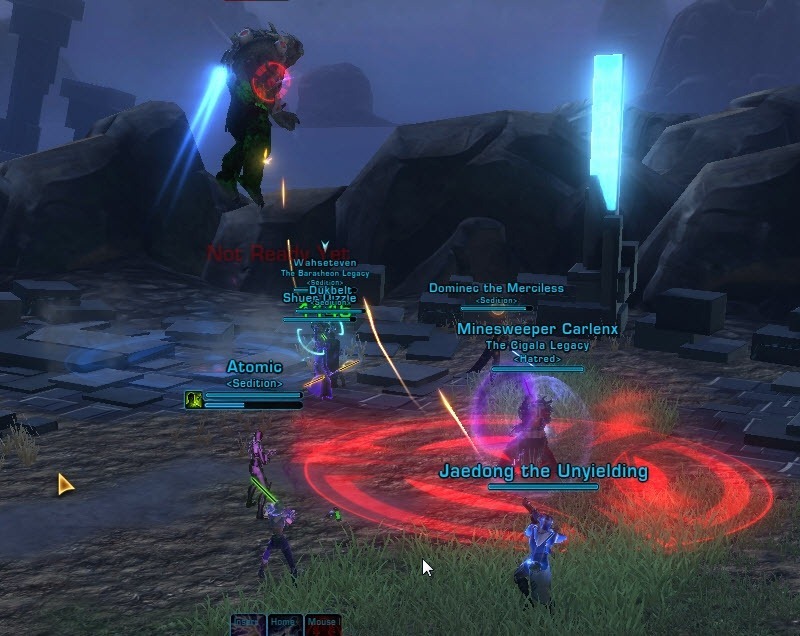 Sorcs/sages should also place their bubble shield onto that person to mitigate some of the damage. 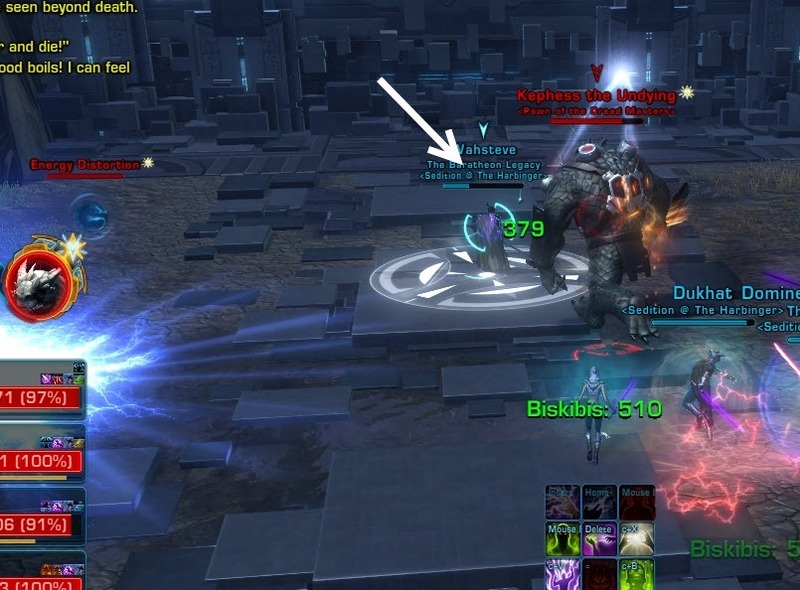 Needless to say, the person with the red circle should move away from the rest of the raid so they don’t take any unnecessary raid damage. 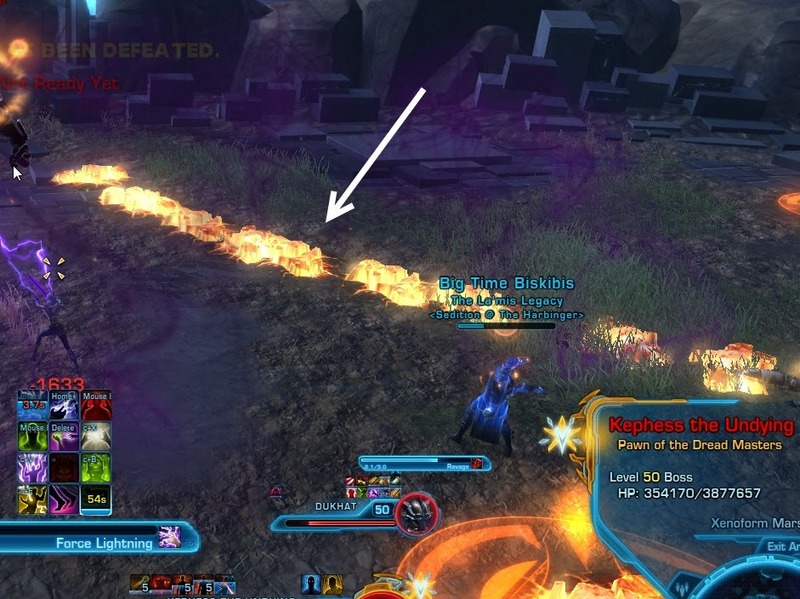 Radioactive Barrage is essentially a lava trail that follows the targeted person (you will see a red text on screen). Whoever being targeted need to run away from the raid and basically do a circular lap on an empty area before returning to the raid. This will drop the lava trail well away from the raid. Kephess seems to have a preference for targeting the furthest person in the raid for radioactive barrage. You phase 2 you will get 4 pillars to work with. The pillars, like in storymode, have a dual function. You use it to both cleanse Corrupted Nanites off players and breaking the pillars to knock Kephess down for increased damage. You cannot miss a single pillar here as doing so will most likely cause trouble with enrage. You will need to break the pillars when Kephess is next to it to knock Kephess down. Breaking the pillars when Kephess jumps away will basically “waste” that pillar. Corrupted Nanites on hardmode do not fall off and will keep increasing in stacks (at 4 stacks it deals over 7k damage a tick) until it is cleansed with a pillar. Therefore, you have to manage pillars so you have one left for the P2-P3 transition but do not wait too long between pillars such that players die from Nanites damage. Click on the pillar will immediately cleanse you of Nanites but the pillar does not break until everyone on it either cancel the channel or let the channel finish. On hardmode this channel is 6 seconds but might be shorter if you have alacrity (for me it is 5.6 seconds). Once two players get the corrupted Nanites debuff, we click on the first pillar and break it immediately if Kephess is nearby (we don’t wait for the 3rd person as it takes too long and the first person may get too many stacks of Corrupted Nanites and die from it). For the next two pillars, we wait until 3 players get the Corrupted Nanites debuff. All three players stack on the pillar and as soon Kephess returns from his jump, everyone clicks, count to 2, and cancel the cast to break the pillar. For the last pillar, we use it when Kephess is at 11-12% so we can break it and push Kephess into Phase 3. Pop all DPS cooldowns here. Phase 3 is basically a burn phase but Kephess also have two nasty abilities. We bubble shield all raid members before going into P3 and everyone pop medpacks etc to help survival. If you use the last pillar at 11-12%, you should get Kephess ~7% before he gets up and start phase 3. One really easy trick for P3 is to have everyone but the tanks stack up on Kephess. Tanks will need to run around and dodge the circles but everyone else can just go full DPS on the boss. Deals 1.6k damage every second until Kephess is dead. Soft enrage mechanic. Circles on the ground that will target raid members and deals 5k damage to them if they don’t move out of it immediately. One thing to note: when someone has nanites and is channeling on a pillar, the pillar will fall as soon as they *stop* channeling. So you should use this to knock him down at your convenience. Otherwise the damage output can be quite staggering, even on normal. I guess what I mean is, we were confused by the wording, so thought it only fell after finishing the whole channel… It’s next to impossible to line that up on him. We had trouble during phase 1. When he channels the laser blast, he stops moving, so no way we could get him close enough to the pillar. Is there any way we can predict which pillar he’ll be linked to so we can pull him there in advance ? yes, did you see this pic? look at the beam he has connecting him to a pillar, that will be the one he is linked. Not what I meant ! What pillar he’s connected to is quite obvious, we’d like to get him close to it BEFORE he’s connected to, as we had trouble pulling him soon enough. It doesn’t take that long for the tank to take him to that pillar, you have abou 10-15 s before he starts beaming you… and he doesn’t have to be glued to the pillar either. I have plenty time to bring him from one side of the area to the other, just taunt him as a tank and run to the pillar, easy as that. we had problem in the 3rd phase, the damage he deals to the OP is too high… we get hit by 5K hits from his mortar… Do we need to position him, or ourselves??? Hey there, we just killed him on HM tonight and indeed 3rd phase now is a pain. 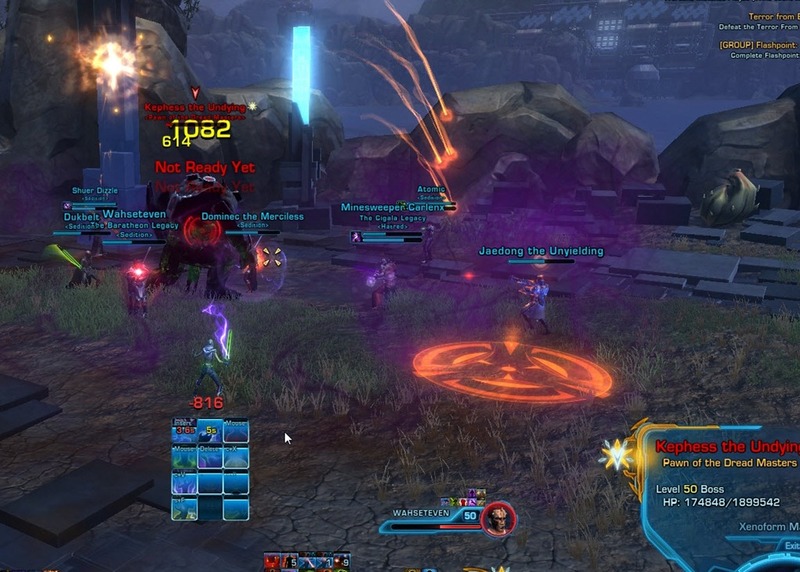 The way we dealt with it is by just move when you see the circle and just maximize your DPS as much as possible. Also, one thing that really helped us was breaking the last pillar when the boss is at 11%. This will allow you to burn him down to 7% when he is down on the ground and when he get up you only need to burn 7 % more. We wiped alot of times at anywhere from 1-3% until we tried that. I will post our video in a bit, it is uploading atm. Hope this can be used to help out other guilds as they face this encounter. Just did this for the first time on SM last weekend and noticed that people were having trouble avoiding red circle damage, even when constantly moving. The circle follows right on your heels, and as soon as it disappears the damage hits about a half second later, making it seem as though even SM is somewhat unavoidable since the AoE is of course larger than the reticle… has anyone else noticed this? We had a tank that hat to bail out, we replaced it with a healer. So we assigned 1 healer on the tank. Other 2 healers were on rest of group. Realy made the fight easy. We’ve been trying to get this guy down several times on SM but we keep dying in Phase 2. The red circle seems unavoidable and then the blue circle finishes it off. Is there a particular place we should be dumping the red circle? Sorry for the late reply, if the red circles are unavoidable, considering getting everyone topped off and bubble shield whoever has the red circle. This is how we do it on HM to survive the red circle. On the 3rd Phase (Mortar phase) everyone crash on the boss stack up on him and have the 2 tanks run around. they draw the mortars and everyone else can burn the boss and only take 1-2 hits at most. healers drop aoe heals and all is good. Take a look at this video let me know what you think. At Phase 3 all DPS including Range DPS need to stack up on Kephess but the Tanks? Just feel like pointing out to those who come now, with a decently geared group on storymode- 16 man mainly, not sure about 8- his mechanics can essentially be ignored and you just burn him down.